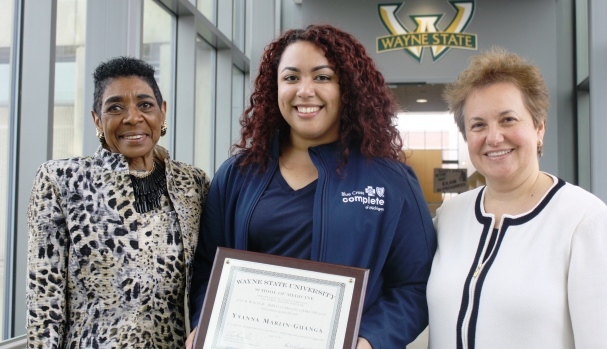 Graduate student Yvanna Marlin-Guanga likely never imagined that the couple who would provide her with a scholarship allowing her to complete the Master of Public Health program at the Wayne State University School of Medicine would be married in nearly the same spot she and husband, John, wedded two years ago in Philadelphia. Last month, Marlin-Guanga, a Philly native, was awarded the 2017 John B. Waller Jr., Dr.PH and Menthele (Mikki) Waller Endowed Scholarship in the Master of Public Health program in recognition and appreciation of her excellence in scholarship and community engagement. Mikki Waller was on hand to present the scholarship to Marlin-Guanga at Master of Public Health Students Celebration held Aug. 24 in Scott Hall, part of the program's annual orientation for new students. She also served as the event's honored guest. "I feel beyond honored as the recipient of this endowed scholarship. Prior to the ceremony, I had the pleasure of meeting, thanking and getting to know Mikki, where our commonalities made it seem like our encounter was meant to be," Marlin-Guanga said. "Surrounded by mentors who aided and instructed me in my journey, I felt that I had developed into a true public health advocate and professional by the end of the ceremony. Receiving this scholarship became a physical manifestation of my professional and personal growth, as I will now be able to take my final M.P.H. course at WSU and complete my degree without financial burden or worry." She entered the Department of Family Medicine and Public Health Sciences program in 2015, and plans to graduate this year following the completion of her public health practicum field experience at Centro Multicultural La Familia in Pontiac, while working at Blue Cross Complete of Michigan as a Community Health Navigator for Medicaid and Healthy Michigan Plans. "Dr. Waller would have been so proud of Yvanna Marlin-Guanga and her accomplishments," Mikki Waller said. "This year, it was wonderful to see the new class of master's of public health students, and for them to hear from Dr. Herb Smitherman about Dr. Waller and how the M.P.H. program began. I look forward to next year and celebrating the public health accomplishments of our students." Marlin-Guanga served in a variety of community and public health educational initiatives in metropolitan Detroit, including those addressing diabetes and prostate cancer. She has also assisted in research while maintaining an excellent academic record. Her ongoing commitment to the area's diverse and vibrant public health community is reflected in her leadership in the WSU Public Health Student Organization, practicum with multicultural families and continuing to explore research opportunities in prostate cancer survivorship care. Dr. Waller, who established the foundation of the School of Medicine's Master of Public Health program, was considered by many as the community face of public health in metropolitan Detroit, serving as Detroit's director of Public Health and as chair of the then-Department of Community Medicine. He was one of the nation's first researchers to treat interpersonal violence as a public health issue. His focus on population-based epidemiology also encompassed maternal-child health, chronic and disabling conditions, and health disparities. At the time of his death in 2006, he was director of the WSU Institute for Maternal and Child Health, director of the WSU Division for the Prevention and Control of Interpersonal Violence, and senior vice president for Urban and Community Health for the Detroit Medical Center/Wayne State University Community Health Institute. He served as a public health professional for more than 40 years. "We are enormously honored and grateful for Dr. and Mrs. Waller's continued commitment to support public health initiatives in the greater Detroit area through the scholarship," said Department of Family Medicine and Public Health Sciences Chair Tsveti Markova, M.D., F.A.A.F.P. "We are an educational institution dedicated to engaging our community in best practices. Because of this, we are so proud of Yvanna's accomplishments within the Master of Public Health program. She is the type of student that all of our incoming and current M.P.H. students hope to emulate in their time with us." In 2006, Mrs. Waller, the WSU School of Medicine, and the Department of Family Medicine and Public Health Sciences established the Dr. Waller Achievement Award in his memory. The first Dr. Waller Endowed Scholarship was awarded in 2016.